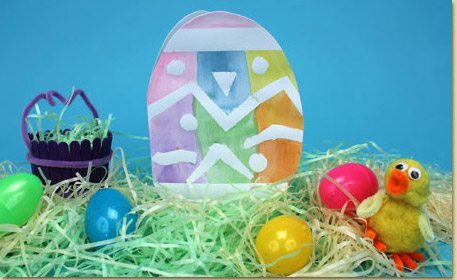 Create an Easter card that looks like a dyed egg using a fun resist technique! Fold a piece of card stock in half to make a card. Draw a large egg on the card, making sure part of it hangs off the left hand folded side, as shown. Cut a piece of tape that is a little wider than your egg. Tip: before applying the tape directly to your paper surface, you must stick it to your shirt or pants to help remove some of the tackiness. This will lessen the amount of adhesive on the tape and allow it to be easily removed at the end of the craft. Apply tape to the card. Cut more pieces of tape and stick them to your card to create a design. Note: wherever you place the tape will remain white once the card is painted. Older crafters may experiment by cutting shapes out of the tape, such as triangles or circles. Add water to your watercolor paint palette and decorate your egg card. The light, pastel colors of this palette work great for Easter themed crafts. Remember, you can paint right over the tape! As soon as you are finished painting, gently remove the tape. It is best to remove the tape as soon as possible, to minimize the risk of ripping the paper. You should see a beautiful white design on a colored Easter egg! Use scissors to cut out the egg shape. Don’t forget to add a message inside before giving it to a loved one this Easter! A resist is when a material, such as glue, tape, or crayon is applied to paper and then painted over with watercolor paint. The watercolor doesn’t stick to the part of the paper that is covered with the masking material. If you use tape, you can remove the tape to reveal the original color of the surface. If you use glue, the glue dries as a raised material, so it adds some texture to your artwork and is a nice way to separate solid areas of color.